Adjuvants are materials used to stimulate and enhance the immune response to an immunogen. By mixing the immunogen with the adjuvant to form a stable emulsion, a sustained presentation of the antigen is achieved. This depot effect results in improved immune response and higher serum antibody levels. Freund’s Adjuvants are used to form stable water-in-oil emulsions that continuously present the antigen to the immune system, resulting in high and long-lasting antibody response. 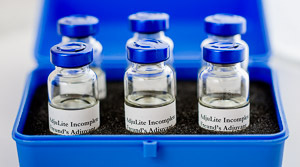 AdjuLite™ Complete Freund’s Adjuvant is used for the first immunization in a production protocol. 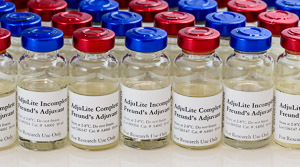 AdjuLite™ Incomplete Freund’s Adjuvant is used for all subsequent immunizations.